not only my birthday but my mom's, who's birthday was the 13th. I was so excited to go to a city I had never been to and to enjoy a climate that is my favorite; cold and cloudy. This is the trip from my point of view, a digital photo album. This was my first view of Washington. Not a bad start. Our hotel was down town, right next to the Seattle Library and down the street from the Court House. After grabbing a quick bite. We headed to Pike Place Market. Which is not just a tourist trap. Every local I spoke with goes there often as well. It was just beautiful. Of course we saw the flowers. These are the most beautiful bouquets for $10.00 a bunch I've ever seen. Tulips are my mom's favorite flower so this was up her ally. We also found out that there is a tulip festival near Seattle, from friends, later in the year. Here is a view from inside the market. The clouds, the daffodils, the brick! So pretty. 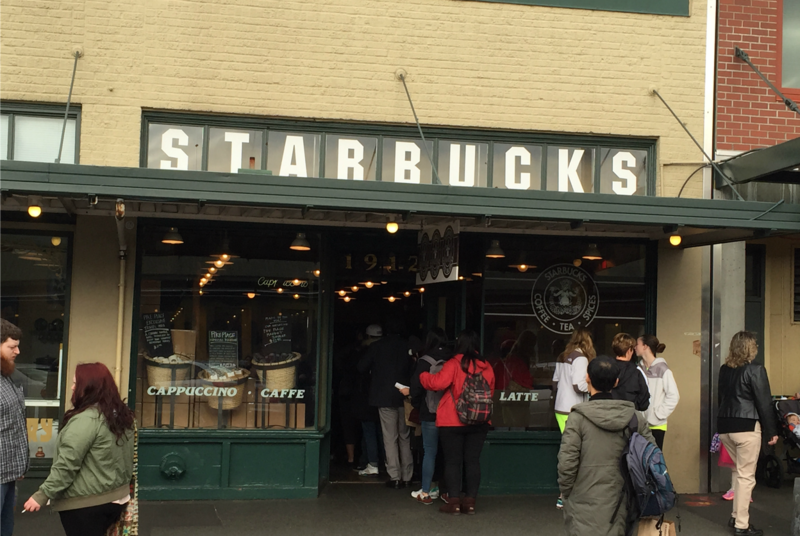 As a coffee addict I had to see the original Starbucks shop! After we walked around there for a bit we wandered down to a little park near by. We got to see the most amazing view. The next day we grabbed a quick breakfast and coffee at Starbucks and headed down to the peer to go to the Aquarium. We started at the outdoor exhibits as three school buses let out for a field trip and it was getting kind of loud inside. haha There was an aviary that housed this little guy and other. It was raining this day and it seemed to have all the animals in a playful mood. The Harbor Seals kept coming up and waddling around, disappearing under the water and playing with their Seattle Seahawks football. There is only one way to showcase Sea Otters and that's in video. They are my absolute favorite. The views from outside the Seals habitat is absolutely gorgeous. After we looked at more fish and we left the Aquarium to look at the surrounding suburbs. My mom and I just love to drive around and get lost (sort of) in a city and it's neighboring areas. This was the view on the drive back to the hotel. Our hotel was in walking distance to an amazing Italian restaurant called Tulio. It was voted one of the top 5 Italian restaurants in the country a couple years ago. We shared sweet potato gnocchi served with sage butter and marscarpone cheese. My mom got grilled sturgeon with a salad of mixed greens, onions, yellow cherry tomatoes, served with extra virgin olive oil and a citrus vinegarette. I got a Risotto with Sicilian almond butter, blood orange, broccoflower and parmesan. We had bites of each others dishes and both were amazing! The next morning was my birthday and we went to a spot across the street from our hotel called Sazerac. It had a warm, inviting atmosphere. They had the best coffee I've ever had at a restaurant. I got a omelette with ham, goat cheese, sauteed onions and spinach. It came with home fries, sourdough toast and strawberry jam. Next it was off too the zoo! The Seattle Zoo is over 100 acres. If you go, prepare to walk. Mom and I were very excited because the man at the front said that there were lion cubs and that they would be out today. We made our way through "Africa". The hippos were feeling sleepy on this drizzly day. Here's a picture of the whole family. I was very impressed with how large the habitats are for the animals. This is super zoomed in, but I had to!! They're so cute. This was the largest Komodo Dragon I have ever seen in person. But for me the highlight was the pack of wolves. I have a special place in my heart for wolves and coyotes as one of my most special dogs (that passed away last year) was a hybrid. Seeing wild dogs like these is like seeing a little bit of him. He moved like them and had those wild golden eyes. After walking around the entire zoo for five and a half hours we were cold and ready for lunch/dinner. We needed soup, so I just googled the closest Pho restaurant. We sat ourselves and were brought over cucumber water in mason jars. The table settings were a dish towel, a soup spoon and chop sticks. We decided to get the fried calamari tossed with kimchi as our appetizer. It was great. The broth was the best I've had. The meat was good, but the BROTH!! And I'm a bit of a Pho junkie. If you live in the area or if you are visiting, I recommend a trip to Bol. The next day we went back to Sazerac. They have brunch on Saturdays and Sunday and the menu changes. I got creole eggs Benedict. Instead of English muffins it had corn cakes and a bit of Cajun seasoning. other than that, it was pretty traditional. Then we headed out to Snohomish to visit longtime family friends. It was beautiful and if I had more room in my suitcase I would have gotten so many antiques. Snohomish is the Antique Capital of the North West. 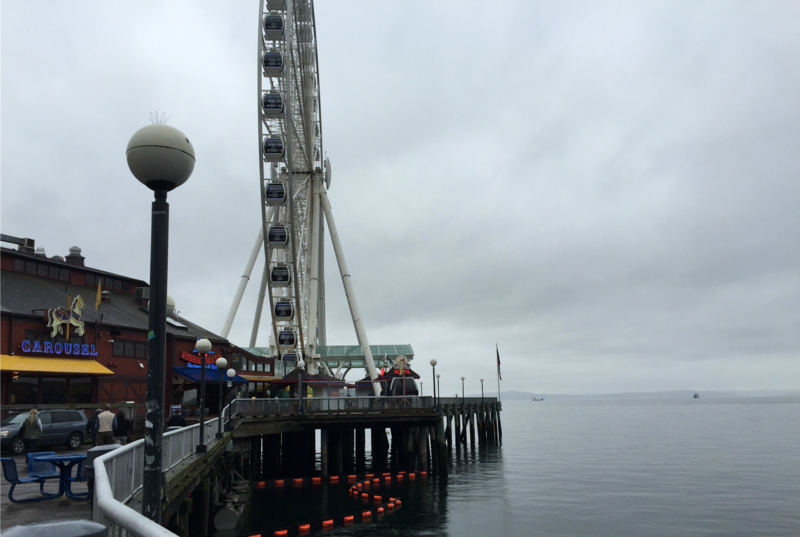 The town was adorable and along with the rest of the Seattle area it was surrounded by water and natural beauty. So for four days that was as much as we could fit in and I thought we did a good job. Over all this was a wonderful birthday and I was glad to spend it with my mom and grateful for the gift from both my parents. Hope you enjoyed the look into my trip!